The 2015 Springfield Scholars gather around honorary scholar Mr. Terry Shelton in front of his framed tribute. Pictured, from left, are Zuhair Somjee, Ethan Hurst, Ethan Lam, Loyd Templeton, James Blatchford, Philip Wunderlich, Mr. Shelton, Ev Nichol, Sellers Shy, Ty Williams, William Quinlen, and Garrott Braswell. Inspiring testimonials, proud parents, and a surprise tribute marked the 10th annual Springfield Scholars dinner May 7. 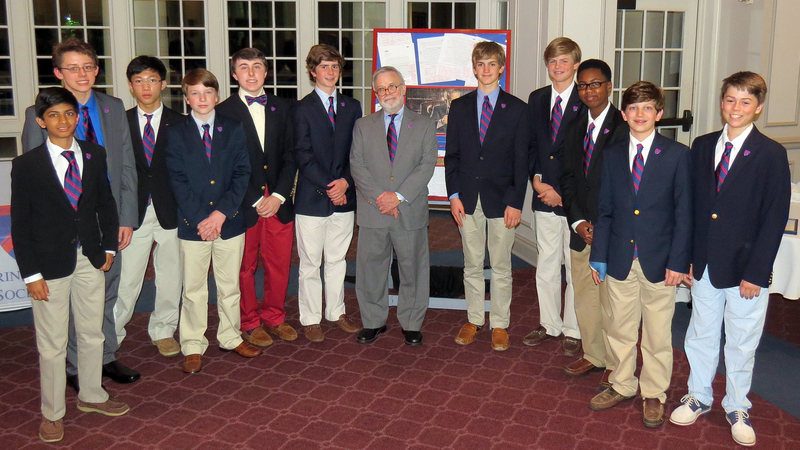 Each of the inductees – James Blatchford, Garrott Braswell, Ethan Hurst, Ethan Lam, Ev Nichol, William Quinlen, Sellers Shy, Zuhair Somjee, Loyd Templeton, Ty Williams, and Philip Wunderlich – received a commemorative tie, certificate, and pin, as a favorite teacher spoke in his honor. Named in memory of the first Lower School principal, the late Mr. John Murry Springfield, this is the most esteemed honor society in the Lower School. An eighth grader qualifies for induction if he is in the top 10 percent of his class based on a weighted numerical average. In addition he must have demonstrated character consistent with the high standards of the school’s Honor Code and Community Creed. Seniors Andrew Elsakr, Sherman Tabor, and Griffin Wilson, Springfield Scholars Class of 2011, offered their perspectives on staying the course through to graduation. Mr. Bruce Ryan ’80, former Lower School instructor in math, who conceived the Springfield Scholar program along with Lower School Principal Clay Smythe ’85, was an honored guest. Mr. Terry Shelton, instructor in English and holder of the A. Robert Boelte, Jr. Chair of Excellence in Teaching, entertained the gathering with stories about Springfield, who was known for excellence and self-discipline in his life, and his unyielding expectation that students would achieve the same. Smythe inducted Shelton, who is retiring this month after nearly 38 years at MUS, as an honorary member of the Springfield Scholars. (Shelton’s longtime colleague and co-author of The Owl English Handbook, Mr. Jim Russell, was inducted in 2013.) Smythe also presented the legendary English instructor with a framed tribute that enshrined one of his infamous red pens and some of the student essays Shelton had corrected in a profusion of crimson script. “Papers covered in red ink is a lot of what we’re about,” Smythe said. “All those corrections, edits, and suggestions for revision represent the countless ways Mr. Shelton has demonstrated his care for his students, spending 45 minutes to an hour grading an eighth-grade essay, shaping the boys, line by line, into writers. It’s what we do here – adults coach, confront, re-direct, and encourage boys; both on the playing fields and in the classroom – and the result is boys discover within themselves what they never thought they could do. See more photos from the induction ceremony HERE.